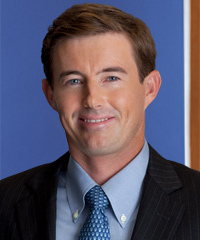 Brian Bissell is a Senior Vice President and Client Advisor at the Orange County office of Whittier Trust. He provides a full range of wealth management, family office and trust services, and has experience working with multiple generations of high net-worth families. Brian specializes in making complex estate-planning techniques, investment plans and asset-protection strategies clear and comprehensible. He intimately knows the values and objectives of each family he works with. Every client is unique with varying needs, and Brian excels at creating customized and individually tailored financial programs and solutions. He received his MBA from the USC Marshall School of Business, where his focus was finance, and earned his Bachelor’s degree in business administration from Georgetown University’s McDonough School of Business. He is both a Certified Trust and Financial Advisor (CTFA) and a Certified Financial Planner (CFP). In addition, he holds a Professional Graduate Certificate in Real Estate Investment from Harvard University. Brian is a member of the Orange County Estate Planning Council and the Association for Corporate Growth. While at Georgetown, he was a member of the national championship-winning sailing team and a three-time All-American. When he isn’t working, you can find him sailing in races such as the biennial Transpac or on a boat in Newport Harbor with his wife and dog.